Martin Wirsing is one of the earliest contributors to the area of Algebraic Specification (e.g., ), which he explored in a variety of domains over many years. Throughout his career, he has also inspired countless researchers in related areas. 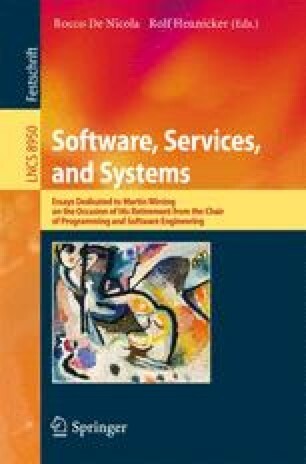 This paper is inspired by one of the domains that he explored thirty years or so after his first contributions when leading the FET Integrated Project SENSORIA : the use of constraint systems to deal with non-functional requirements and preferences [13,8]. Following in his footsteps, we provide an extension of the traditional notion of algebraic data type specification to encompass soft-constraints as formalised in . Finally, we relate this extension with institutions  and recent work on graded consequence in institutions .